The Collaborative School, an after-school program in the area hit by the Great East Japan Earthquake was, on December 12, 2012, awarded the top prize at the "Iine!" Japan Social Awards ceremony. (Iine! means Like! in Japanese.) The award is intended to highlight activities aimed at solving social problems throughout Japan, introducing these activities on Facebook, and awarding the best programs. The school program started in 2011, in Onagawa Town in Miyagi Prefecture and Otsuchi Town in Iwate Prefecture, to provide a place to relax after school for children who lost their homes in the tsunami disaster and are forced to live in small, temporary shelters. 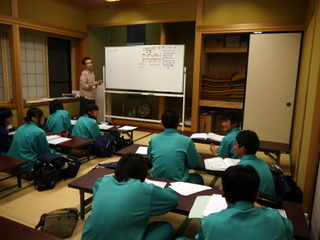 The schools are administered by Katariba (meaning "place for sharing" in Japanese), a non-profit organization (NPO) that runs career education for high school students, mainly in the Tokyo metropolitan area. Local supplementary school teachers are hired by the NPO with donated funds from supporters nationwide. The teachers and volunteers work with about 400 elementary and junior high school students. With the aim of fostering local students to be future leaders of recovery of the Tohoku area, the NPO aims to improve the academic performance of students and help them develop their career goals, by interacting with a diverse range of people including teachers and volunteers.